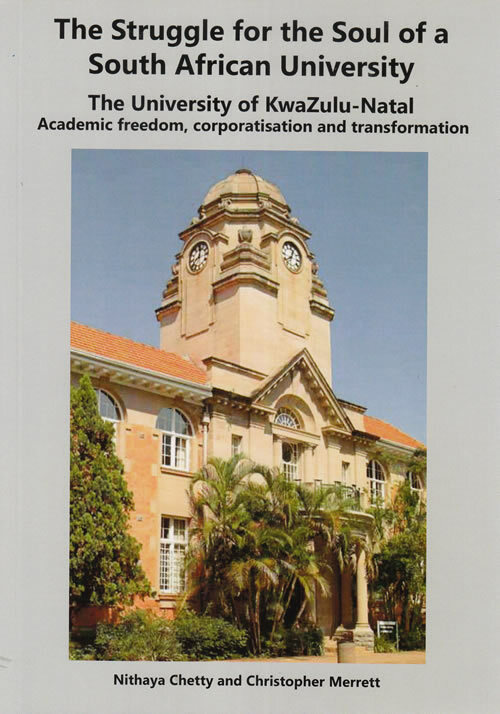 Academic freedom, corporatisation and transformation. The Struggle for the Soul of a South African University is a book about governance in higher education. After the University of KwaZulu-Natal (UKZN), an amalgamation of the old universities of Natal and Durban-Westville, was established in 2004 it embraced policies of managerialism, corporate behaviour, centralisation and racial quotas. Custodianship for the greater good and collegiality gave way to line management, legalism and industrial relations. Academic rule collapsed, illustrated most spectacularly by the sidelining of Senate. Collective identity was valued more highly than intellectual achievement. Written as part-polemic by two university insiders, this book charts institutional decline and dysfunctionality, considers the troubled term ‘transformation’ and analyses the phenomenon of serial crisis. It addresses in depth a string of commissions of inquiry and disciplinary proceedings and explains why these constituted such a major threat to academic freedom that the international academic community expressed extreme alarm. This was well warranted: the institutional and constitutional rights of academics proved illusory. While post-apartheid rights flourished, in one South African university they contracted. Peter Vale, chair of Humanities at the University of Johannesburg describes this book as a ‘riveting read’ and commends its ‘highly original critical frame’. UKZN continues to function amidst crisis. Its first decade forms a salutary part of the history of higher education in the province and speaks to upheavals at other South African universities. Nithaya Chetty holds a doctorate from the University of Illinois and undertook post-doctoral research in Denmark and the United States. At the time of his dramatic exit from University of KwaZulu-Natal in December 2008 he was associate professor of and head of the Computational Physics programme. From 2007 to 2009 he was president of the South African Institute of Physics during which time he moved to the University of Pretoria where he was promoted to full professor. He is now deputy CEO at the National Research Foundation responsible for implementing and co-ordinating South Africa’s astronomy programme. Christopher Merrett has a doctorate in History from the University of Cape Town. After a career in copyright and academic libraries he became University Librarian and then Director of Administration (1996−2002 and 2002−2007) on the Pietermaritzburg campus of University of Natal/UKZN. After his departure from the university he worked as a journalist for The Witness for seven years. He is now a freelancer working on various aspects of book publication and chairperson of the Natal Society Foundation Trust. including postage within South Africa. Christopher Merrett at kitteddyhall@gmail.com to order and for further information.